The air your kids breath could be hurting their grades in school. Air pollution concentrations from industrial sources, with school locations. 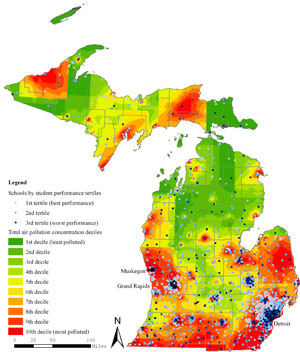 A new study by University of Michigan researchers links air pollution near Michigan schools to poorer academic performance, and poorer student health. The report says that schools located in areas with high industrial air pollution levels had the lowest attendance rates and the highest amounts of students who failed to meet state educational testing standards. Out of almost 3,700 public schools in Michigan, 62.5 percent of them are located in places with high levels of air pollution from industrial sources, according to the research. The majority of the most-polluted sites in Michigan are in the southern half of the Lower Peninsula. The most-polluted locations form a horseshoe-shaped band stretching from the Thumb region south to the Ohio border, then west to Lake Michigan and north to Grand Rapids and Muskegon. The researchers say Michigan and other states should require an environmental-quality analysis when officials are considering sites for new schools. The research was published in a peer-reviewed journal called Health Affairs. A ‘Dirty Dozen’ list of Michigan sewer systems includes Bay and Saginaw counties. The list, from the Michigan Infrastructure and Transportation Association, points to almost 15 billion gallons of raw or partially treated sewage that’s been discharged to Michigan rivers, lake and streams in the first four months of 2011. Included in that 15 billion gallon figure, taken from state records, is more than 88 million gallons of sewage from Bay County, the third-highest discharger in Michigan, below Wayne and Macomb counties. Bay County sewage goes to the Saginaw River and Saginaw Bay. Saginaw County came in at No. 5 on the list, with 63 million gallons. A total of 86 percent of the Dirty Dozen sewage came from Wayne County, with 13.4 billion gallons. Sewer discharges occur when overloaded and aging sewer systems are overwhelmed by heavy rains or snow melt. In Bay and Saginaw counties, sewage typically receives partial treatment before a discharge. But partially treated sewage still contains bacteria that can lead to beach closures and river contamination advisories. The association says the state needs to take long-overdue steps to repair or replace Michigan’s aging underground sewer systems. Last week, we talked about DTE Energy. This week, it’s Consumers Energy. The Jackson-based utility says its customers saved about $38 million last year through an energy efficiency program. One of the most popular aspects was the sale of discounted light bulbs. Last year, 1.2 million compact fluorescent light bulbs were sold at a lower price at several retailers as part of the Consumers Energy program. Payments for recycling old refrigerators and freezers also were popular, the company says. Customers can receive $30 for offering up old fridges and freezers to Consumers Energy. The company picks up the old appliances, and people save an average of $150 a year on their electric bills by unplugging an energy hog. Consumers Energy says 2010 energy efficiency efforts saved enough energy to supply electricity to about 30,000 homes. Consumers Energy customers pay a total of about $3 a month in surcharges on their electric and natural gas bills to fund the energy efficiency program.